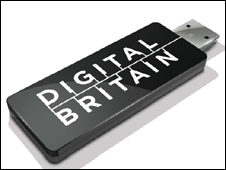 On 17 October 2008, Lord Carter, the minister for communications, technology and broadcasting, began work on a report dubbed Digital Britain. The idea was to create an action plan that would secure the UK's place at the head of the new media age. An interim version was released on 29 January and the wide-ranging report tackles everything from broadband speeds to internet regulation and public service broadcasting. The final version is due in June. Here are some of the key points taken from the report. The success of our manufacturing and services industries will increasingly be defined by their ability to use and develop digital technologies. A successful Britain must be a Digital Britain. The UK's digital economy accounts for around 8% of GDP. It has been one of the fastest growing successes of the past decade. By 2012 £1 in every £5 of all new commerce in this country will be online. More importantly, the digital economy underpins our whole economy and builds our national competitiveness. Our readiness to adopt digital technology has driven productivity gains throughout our wider economy. Over the last ten years the UK has been consistently closing its historic productivity gap with the other leading European economies, based largely on our take-up and adoption of digital technology. Britain's competitive position as a user and producer of digital technology cannot be taken for granted. The European Commission's global league table of digital adoption, skills and use shows that the UK, having been in the top seven earlier in the decade, has slipped to twelfth place. We must ensure that our wired and wireless communications and broadcasting networks can meet the demands of a modern knowledge-based economy. ...over the next five years we will need to upgrade these networks in order to maintain our position and meet our ambitions. We need to plan now, identify the market failures that are standing in the way of a full roll out of digital infrastructure in the UK, and act swiftly in Government to help the market in the timely delivery of the high-capability infrastructure we will need. This is not simply a question of economic competitiveness, but also of fairness. We must ensure that being digital is within the grasp of everyone. If we do not, we risk leaving significant parts of our society disenfranchised and permanently behind the mainstream. Delivering Digital Britain will require an ambitious and clear strategic vision from Government and a new and stronger sense of co-operation between Government, regulators and industry. The interim report commits the government to 22 specific actions that are detailed below. 1) Find out how far advanced are the plans of BT, Virgin Media and others to build next-generation networks. 2) Remove market and regulatory barriers that limit access to net infrastructure. 3) Ensure the Valuation Office Agency's new guidance on business rates is fully understood by potential investors. 4) Assess whether government subsidies will be needed to ensure next-generation networks are built. 5) Create an umbrella body to advise local and community groups setting up their own high-speed networks. a) Helping operators rationalise their spectrum holdings. b) Freeing spectrum for next generation mobile. c) Making investment in 3G networks more palatable. e) Prompting operators to extend mobile broadband coverage. 7) Assess whether digital TV switchover help schemes need a return path option. 8) Find out if money to inform people about digital TV could be better used to promote other services. a) Committing to making digital radio a primary distribution network. b) Creating a digital radio migration plan. c) Working with industry to make digital radio more attractive to consumers. d) Helping the BBC ensure its digital radio coverage replicates its FM footprint. e) Calculating the costs of digital migration. 10) Examine the challenges the net poses to digital content - music, movies and games. 11) Find out if the UK needs a Rights Agency to encourage people to use legal sources of copyrighted material. 12) Discover if people are willing to pay a "modest" fee to offset losses from piracy. 13) Consult on legislation to make ISPs help rights holders identify unrepentant pirates. 14) Carry out a market review of conditions in local and regional media. 15) Examine terms of trade that exist between independent producers and broadcasters to see if they need to be reformed. 16) Find out whether a second public service broadcaster can be created, perhaps by merging BBC Worldwide and Channel 4 - that acts as competition to the BBC. 17) Draw up plans for a universal service system that would guarantee every home can get 2Mbps by 2012. 18) Reform current universal service obligations to help with the broadband plan. 19) Appoint a digital exclusion champion to drive forwards plans for universal take-up of broadband. 20) Invite the BBC to spearhead efforts to get people using broadband. 21) Look at how government delivers its services via the net and ensure they are easy to use. 22) Set out proposals for a national media literacy plan.